The spotted lanternfly is neither a fly nor a moth. This insect is a member of the Order Hemiptera (true bugs, cicadas, hoppers, aphids, and others) and the Family Fulgoridae, also known as planthoppers. Adults are 1 inch long and ½ inch wide at rest. The forewing is gray with black spots of varying sizes and the wing tips have black spots outlined in gray. Hind wings have contrasting patches of red and black with a white band. The legs and head are black, and the abdomen is yellow with black bands. 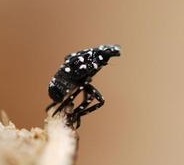 Early instars (immature stages; 1st, 2nd, and 3rd instar) are black with white spots. By the last immature stage, the 4th instar, they develop red patches in addition to the black color with white spots. This is the last immature stage before they mature into an adult. Adults when they have been startled expose the bright red coloration on the hind wings. When the adult is at rest, their gray, spotted color may actually cause them to blend in with their surroundings. Freshly laid egg masses appear as if coated with a white substance. As they age, the egg masses look as if they are coated with gray mud, which eventually takes on a dry/cracked appearance. Very old egg masses may look like rows of 30-50 brown seed-like structures aligned vertically in columns. Learn more and source of information Here. If allowed to spread in the United States, this pest could seriously impact the country’s grape, orchard, and logging industries. Other hosts reported for this insect include: American beech (Fagus grandifolia), American linden (Tilia americana), American sycamore (Platanus occidentalis), big-toothed aspen (Populus grandidentata), black birch (Betula lenta), black cherry (Prunus serotina), black gum (Nyssa sylvatica), black walnut (Juglans nigra), dogwood (Cornus spp. ), Japanese snowbell (Styrax japonicus), maple (Acer spp. ), oak (Quercus spp. ), paper birch (Betula papyrifera), pignut hickory (Carya glabra), sassafras (Sassafras albidum), serviceberry (Amelanchier canadensis), slippery elm (Ulmus rubra), tulip poplar (Liriodendron tulipifera), white ash (Fraxinus americana), and willow (Salix spp.). Learn more & source of information Here . The spotted lanternfly is considered native to China, India, and Vietnam. It has been introduced as a non-native insect to South Korea and Japan. They were transported to the United States in product shipments. Spotted lanternflies can be spread long distances by people who move infested material or items containing egg masses. The adults and immatures damage host plants by feeding on sap from stems, leaves, and the trunks of trees. In the springtime in Pennsylvania (late April – mid May), nymphs (immatures) are found on smaller plants and vines and new growth of trees and shrubs. Third and fourth instar nymphs migrate to the tree of heaven and are observed feeding on trunks and branches. Trees may be found with sap weeping from the wounds caused by the insect’s feeding. The sugary secretions (excrement) created by this insect may coat the host plant, later leading to the growth of sooty mold. Host plants have been described as giving off a fermented odor when this insect is present. Learn more Here. Adults may be found on the trunks of trees such as the tree of heaven or other host plants growing in close proximity to them. The USDA states that dusk is a great time to inspect your trees or other host plants for signs of this pest, as the insects tend to gather in large groups on the trunks and stems of plants at that time of day. Tree of heaven, bricks, stone, lawn furniture, recreational vehicles, and other smooth surfaces can be inspected for egg masses. Egg masses laid on outdoor residential items such as those listed above may pose the greatest threat for spreading this insect via human aided movement. Learn more and source of informatoin Here. Has not been found in Nebraska. Until November 2017, this invasive insect was only known to Pennsylvania. It has now been reported from Delaware (Nov. 20, 2017), New York (Nov. 29, 2017), and most recently, Virginia (Jan. 10, 2018). See quarantine map Here. Quarantines and eradicaiton efforts are underway to contain the insect.